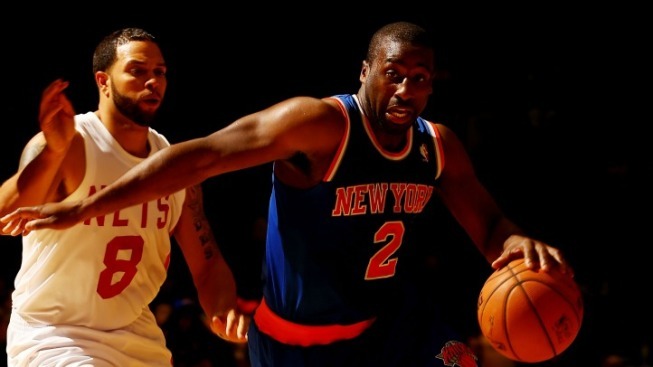 Felton's return has him picking up pretty much where he left off. The biggest takeaway from Wednesday night's preseason finale for the Knicks will depend on the results of an MRI performed on Thursday. Less than a minute into the matchup with the Nets at Nassau Coliseum, whose total irrelevance was confirmed earlier in the day when the Nets' new arena scooped up the Islanders as either tenants or beer vendors, Tyson Chandler banged knees with Gerald Wallace and went to the court in what looked like a great deal of pain. He was helped off the court and taken to the bowels of the arena for examination. It was the kind of innocuous looking play that resulted in such a massive reaction from Chandler that the only appropriate reaction was fear of torn ligaments and broken hearts before the season even starts. Losing Chandler for any extended period of time would be a full-on disaster for the Knicks as their defense is heavily reliant on the center's presence in the lineup. The news wasn't too dire after the game -- Chandler thinks it is a sprain -- but we'll wait for the test results before breathing too deep a sigh of relief. Should those test results confirm what Chandler believes, then the main talking point will shift to the backcourt. Much was made, little of it positive, of the Knicks' decision to let Jeremy Lin take his marketing potential to Houston and replacing him with the Old (Jason Kidd), the Rotund (Raymond Felton) and the Unknown (Pablo Prigioni) at point guard this offseason. Wednesday night provided a chance to see all three in action and it provided the Knicks with some support for their decision to move toward this unlikely trio. Felton has cut a lot of weight and he's looking a lot like the guy everybody enjoyed during his brief stint with the D'Antoni Knicks a couple of years ago. He's running the pick-and-roll with finesse, setting up open shooters or probing deep into the lane on his own to finish with little floaters and layups. He got plenty of those on Wednesday because of Brook Lopez's bizarre interpretation of basketball defense, but you could see the framework of how the offense can work even if the opposition actually tries to stop you from scoring. When he was paired with Kidd, you could see how Felton's ability to drive the ball will set up the older guard to either take an open three or move the ball to the next open man as the defense tries to rotate quickly enough to make a stop. That kind of ball movement would make a world of difference for the Knicks, although we'll admit to needing to actually see it happen in games that count before we believe things have totally changed for a team still built around Carmelo Anthony. We'll also have to wait and see what role Prigioni has in the regular season, but his play in exhibition games suggests that it would be a mistake not to find something for him to do. His pick-and-roll play was even more impressive than Felton's and playing all those years in Europe have left Prigioni with the kind of veteran tricks that help a player survive without exceptional athletic ability. With Kidd looking more like a two guard until Iman Shumpert is healthy, there should be a chance to see if Prigioni can keep it rolling when things move to full speed. The judgment on the Knicks' decisions in the backcourt will be a marathon, so these encouraging signs in games that don't count shouldn't be built up into anything more than they are. After watching last year's parade of awful guards, though, it's hard not to be a bit excited about the team having three guys with the experience and skill set to help the team in a variety of ways.